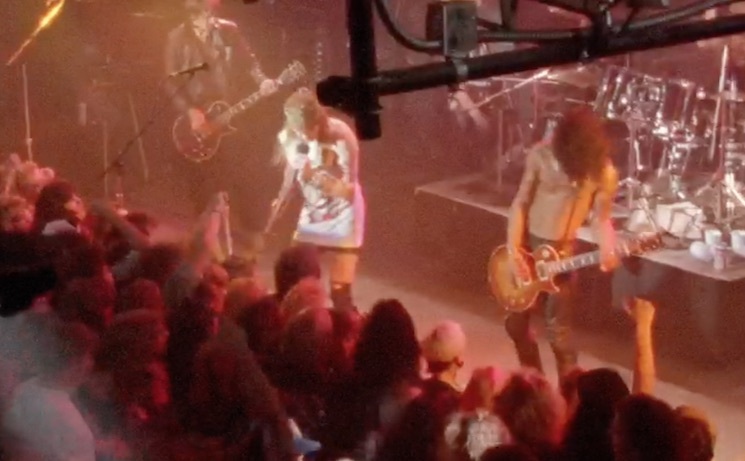 Guns N' Roses Share Previously Unreleased Video for "It's So Easy"
Guns N' Roses recently announced plans for an enormous Appetite for Destruction reissue, and they're further hyping up the release with a previously unreleased music video. The clip was initially filmed in 1989 at Hollywood's infamous Cathouse, but it wasn't completed or released. To coincide with the Appetite reissue, they've transferred the 16mm film to 4K UHD and completed the video. The previously unseen "It's So Easy" video can now be enjoyed exclusively on Apple Music here. As previously reported, the "Locked N' Loaded" edition of Appetite for Destruction will arrive on June 29 via Universal Music Group. You can order it here. The remastered version of Appetite for Destruction is also available on standard CD, deluxe CD, Super Deluxe Edition CD and Audiophile Edition vinyl via MusicVaultz.